A demo is available here. It includes parts from Police Station and Kalinatek missions. The latest patch is 1.3. Digital distribution versions are already patched. Extract the archive and copy the Textures folder to the game installation folder and overwrite the existing files. HD textures are mostly faithful to the original textures, except in the Abattoir level which looks much cleaner. Ads have been removed. The GOG.com and Uplay versions already come with the extra missions pre-installed. Extract the archive and copy the folders to the game installation folder. Delete or rename Logos.bik and videointro.bik. Extract the archive and copy the system folder to the game installation folder. FOV is automatically adjusted to resolution. Removes HUD stretching and moves HUD elements to the edge of the screen. Cutscenes are no longer fullscreen; instead, they are played in an unscaled 640 x 480 resolution. When launching the game a window may appear asking to download the latest version and dgVoodoo 2 which is required to fix some rendering issues. Use either this or ThirteenAG's Widescreen Fix or the FOV will be too wide. For Hor+ gameplay, a new profile must be created after this solution was applied. Otherwise, previously made profiles will still use the old FOV setting. Set Behavior Flags to None. Set Setting to desired AA (e.g. Multisampling). This works only for Nvidia cards. Read the instructions below to properly setup dgVoodoo 2 for this game. Open dgVoodooCpl.exe and click on the DirectX tab. Set Antialiasing(MSAA) to 2x, 4x or 8x. When using ThirteenAG's Widescreen Fix the included <path-to-game>\system\dgVoodoo.conf file overrides the global dgVoodoo settings. Delete/rename that file for the global settings to be applied, or edit that file directly in dgVoodooCpl.exe. Water will be rendered incorrectly in few places (sea in the Oil Refinery level and water in two gardens in the last two levels of the main campaign). Download the latest version of ReShade and run the Reshade Setup program. 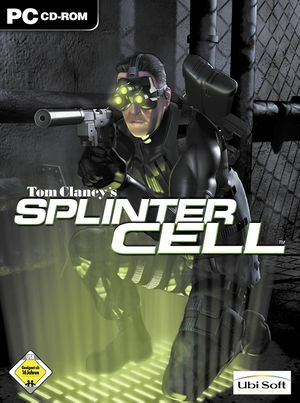 Click Select game, then select SplinterCell2.exe found in <path-to-game>\system\. Select Direct3D 10+ as the rendering API. Allow to download shaders/effects and choose either all of them or just SMAA. Run the game, press ⇧ Shift+F2 to enter the configuration menu and follow the tutorial to create new profile and activate SMAA. 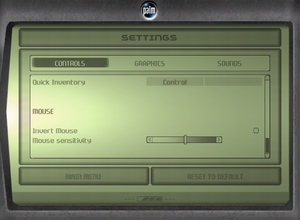 In the Settings tab, under Usage Mode select Performance Mode. Click X in top right to exit the configuration menu. If downloading shader archive fails, download the archive manually and extract it to <path-to-game>\system\. Then in game in ReShade settings add \reshade-shaders-master\Shaders to end of the Effect Search Paths and \reshade-shaders-master\Textures to the end of Texture Search Paths field. Restart the game and continue from Step 6. Ambient, voice, music and SFX. GOG.com and Uplay releases have broken support for EAX Advanced HD, falling back to EAX 2.0. Sometimes when quicksaving or entering the menu (OPSAT) some looped sounds, like clock ticking or water running, can stop playing. Quick save and quick load the game to reset the sounds. In Vselka Infiltration mission after using the laptop in the control room the player can't get out, because the closed doors never open, since enemies that should open them can get stuck in the stairway. Use F2 to open the console. Type ghost and press ↵ Enter to activate the no clipping mode. Go through the closed doors. Type walk and press ↵ Enter to deactivate the no clipping mode. Due to relying on now-obsolete functionality in Nvidia GPUs, the default "buffer" shadows are broken on modern hardware. The game, when tweaked, supports projection shadows, which work on modern hardware. Uncomment ;ForceShadowMode=0 line (remove the semicolon). Extract the contents to the folder of your choice. Open dgVoodooCpl.exe and click the DirectX tab. 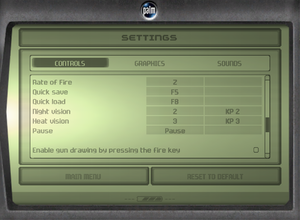 Under Videocard select GeForce 4 Ti 4800 from the drop-down menu. 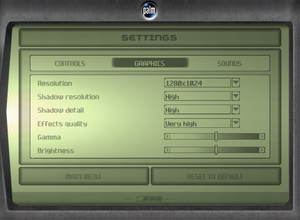 Select 256 MB from the VRAM drop-down menu. Click Apply and OK at the bottom of the dgVoodoo 2 application window. Copy D3D8.dll file from dgVoodoo2\MS\ folder to <path-to-game>\system folder. Requires dgVoodoo2 2.53 or later (included in the newest version of ThirteenAG's Widescreen Fix). Lights will bleed through the walls if you manually add Anti Aliasing to the game via Nvidia control panel (which you can noticeably see in the training level by looking at the walls to your left and right.) You can get ride of most of the bleeding by using your Night Vision and turning it off, but to get rid of all the bleeding you must disable AA through the control panel. 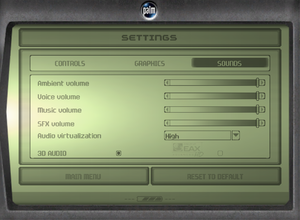 EAX will automatically be disabled if the audio settings menu is opened. The process has to be repeated then. ↑ 3.0 3.1 File/folder structure within this directory reflects the path(s) listed for Windows and/or Steam game data (use Wine regedit to access Windows registry paths). Games with Steam Cloud support may store data in ~/.steam/steam/userdata/<user-id>/13560/ in addition to or instead of this directory. The app ID (13560) may differ in some cases. Treat backslashes as forward slashes. See the glossary page for details.